The Dec. 1974 Kecoughtan Kryer reported that Kecoughtan Lodge accepted a challenge from the SE-1 Council of Chiefs to be the first lodge in the nation to host both a Section Indian Seminar and Newsletter Editor Workshop to be held at Camp Chickahominy on March 22, 1975. The May 1975 Kryer reports that national experts Charles Taylor and Ben Stone from Oklahoma, Ron Head from Massachusetts, and Jay Dunbar from New Jersey provided Indian lore information. The newsletter editor workshop was handled by the Section Newsletter Advisory Committee, headed up by Sam Fairchild. Kecoughtan Arrowman Mike Kinzie was originally appointed as seminar coordinator for the event, but had to relinquish the position when he was appointed as Section Chief. Kecoughtan Chief Ed Dadez appointed Gary McSmith to the role of seminar coordinator, and Chris Currier served as the seminar's program director. 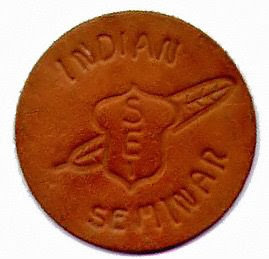 A little known fact about the 1975 SE-1 Indian Seminar is that the leather emblems provided by Kecoughtan Lodge to its attendees were hand made by Gary McSmith and his father, Duane McSmith. "My dad soldered a copper motif, I soaked the leather rounds and pressed them in a very large 'Rock Island' bench vise in my Dad's workshop on Homestead Avenue in Hampton. The fletching marks along the feather were made with a hammer and a small flathead craftsman screwdriver."